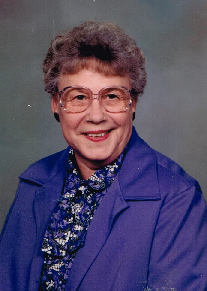 Joan Staton, 90, of Sterling, passed away August 18, 2018 at Hospital District #1 of Rice County. She was born November 21, 1927 in Sedan, KS, the daughter of Andrew and Maude Reynolds Defenbaugh. She graduated from Coffeyville High School, Coffeyville, KS. Joan has resided in Sterling since 1991, formerly of South Hutchinson. Joan was a homemaker, and she also worked for Ben Franklin’s and Walmart in Hutchinson. On October 17, 1948, Joan was united in marriage with Jack E. Staton in Coffeyville, KS. He preceded her in death in July of 1987. She is also preceded in death by her parents; son, Michael Staton; two brothers, Wayne and Cecil Defenbaugh; three sisters, Jewel Koonce, Charlotte Cummings, and Beaulah Staton. Joan is survived by her son, Patrick and Debbie Staton of Sterling; granddaughter, Susie and Shiloh Brogan of Colby, KS; and three great grandchildren, Kiley, Lacey, and Dylan Brogan. Funeral services will be 11:00 A.M., Friday, August 24, 2018 at Birzer Funeral Home, Sterling with Pastor Ron DeVore officiating. Burial will be at the Sterling Community Cemetery. Visitation will be from 2:00 to 7:00 P.M., Thursday, August 23, 2018 at Birzer Funeral Home, Sterling with family present from 5:00 to 7:00 P.M. Memorials can be made to the American Cancer Foundation in care of Birzer Funeral Home, Sterling.